The CH-46 is used by the Marine Corps to provide all-weather, day-or-night assault transport of combat troops, supplies and equipment. Troop assault is the primary function and the movement of supplies and equipment is secondary. Additional tasks may be assigned, such as combat support, search and rescue, support for forward refueling and rearming points, aeromedic evacuation of casualties from the field and recovery of aircraft and personnel. 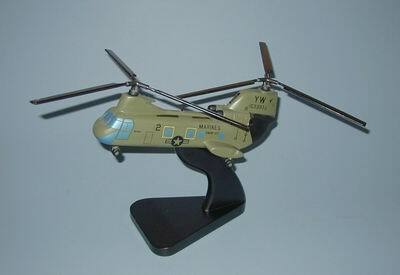 It saw extensive use in the Vietnam War and remains the workhorse of Marine helicopter aviation. Mahogany Wood. Rotorspan 26 inches, Length 14 inches.